Utilizing light microscopy—the stereo microscope and polarized light microscope—is a key component to McCrone Associates’ ability to solve materials analysis issues. With proper education and experience, polarized light microscopy can be very quantitative, especially when measuring the refractive indices of materials. However, the method is dependent on having valid reference materials available; in this instance, refractive index liquids—liquids with a known refractive index and a known response to temperature. Such liquids are needed in a range with fine fixed sequential differences in order to evaluate the refractive index of materials such as glass, minerals, or crystalline materials. Refractive index liquids are only available from, essentially, a single source, and are relatively expensive. A good quality management system requires that chemicals and reference materials are assigned expiration dates upon acquisition. Refractive index liquids, per the manufacturer, have a rather short shelf life once opened. But, do they really? Refractive index liquids are used infrequently and in single drop quantities, and thus by volume last a very long time. Historically, microscopists observed no indications that suggested refractive index liquids were unstable. Given the cost of refractive index liquids, if we could assess their stability, we could then determine the best solution: periodic reassessment or periodic replacement. To decide which path we should pursue in the future, we used a new refractometer, the Rudolph Research Analytical Automatic Refractometer J357, to assess the condition of our refractive index liquids. McCrone Associates’ Rudolph Research Analytical Automatic Refractometer J357. 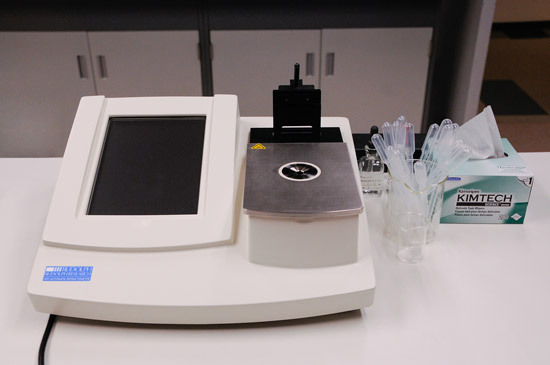 The J357 is a state-of-the-science research instrument for rapidly determining the refractive index of a small volume of liquid. On-board electronic temperature control allows the refractive index to be assessed at a single temperature, and also at multiple temperatures, to ensure that even the temperature correction matches the values printed on the liquid’s label. The J357 allows for a relatively rapid reassessment period, and simple on-the-spot re-evaluation, as needed, for additional confirmation confidence. Our current reassessment project with the J357 suggests that the refractive index shelf life of the liquids is pretty solid to ±0.0002. Our reassessment continues; however, our J357 allows us to document our discovery and establishes a base line for a reassessment plan rather than a periodic replacement plan.